The Ultimate Fighting Championship has partnered with Cinedigm Digital Cinema to produce live 3D UFC pay-per-view broadcasts. The digital theatrical distribution company will break in their new Octagon deal with the UFC’s Super Bowl Saturday card scheduled for February 4th. The show will be available in over 120 movie theaters across the nation. “By partnering with Cinedigm, we’re taking the UFC viewing experience to a whole new level,” said UFC president Dana White. 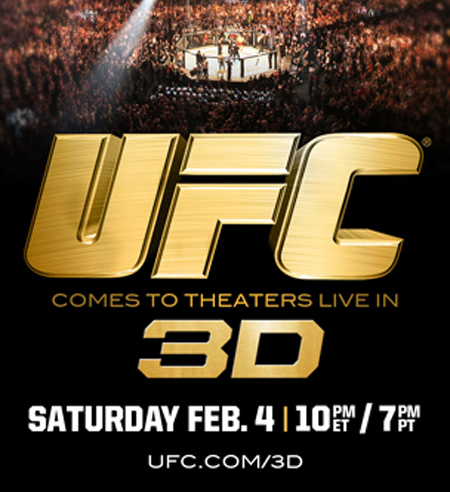 “For the first time ever, fight fans can watch a UFC pay-per-view card in 3D at theaters across the country. The UFC and Cinedigm will host four PPV broadcasts each year. The duration of their partnership was not disclosed. Outside of the event taking place in Las Vegas, Nevada, little else is known about the February 4th fight card.